We're coming to the end of our work at the Skyline Residence, and it's incredible to look back and see the changes that have taken place since we began the process. The living room was previously dominated by a stone-clad fireplace, which was high on the priority list of things the owners wanted to change. 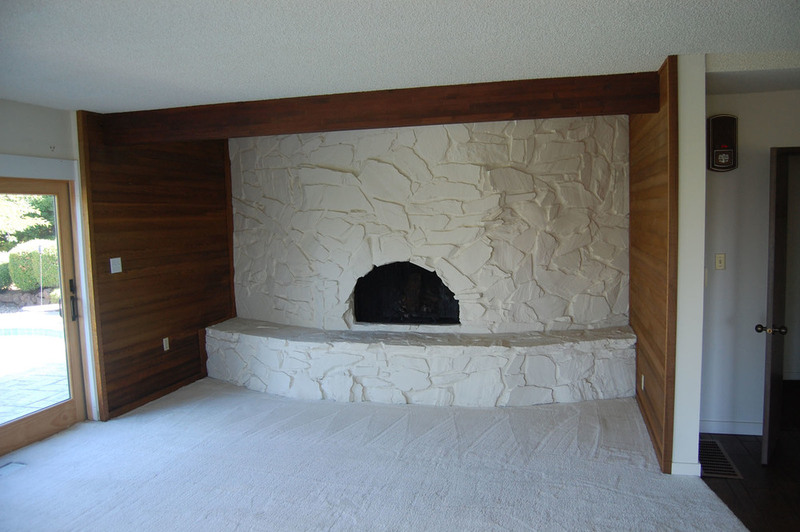 The first step was to strip the fireplace back to its concrete block structure. Drawing on ideas we first explored at the Cable Hill House, we then built a sheet steel fire surround and hearth extension around it, with a walnut entertainment center above it. 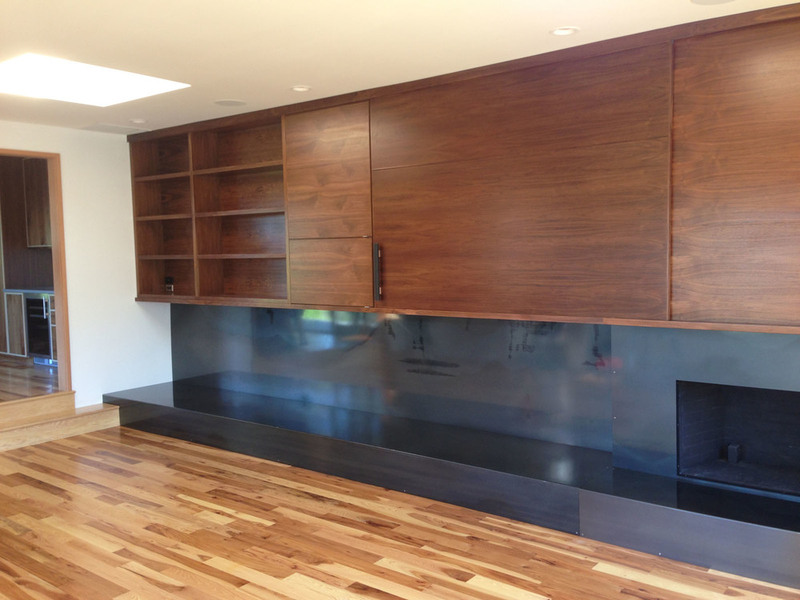 This contains the audio/visual control boxes, and a sliding panel allows the tv to be hidden when not in use. By removing the dropped ceiling, we were able to gain another 15" of ceiling height. The carpet was replaced by new hickory floors, which run throughout the first floor of the house. 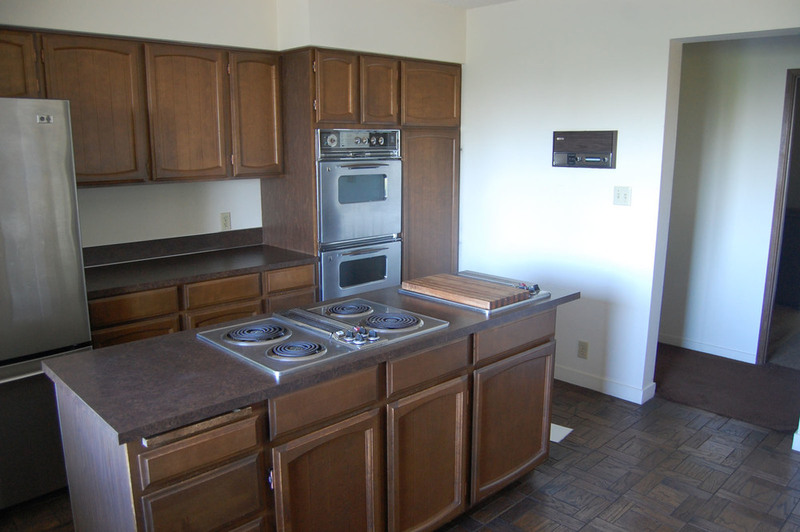 The kitchen remains in the same location in the house, but with a much more efficient layout and contemporary style. 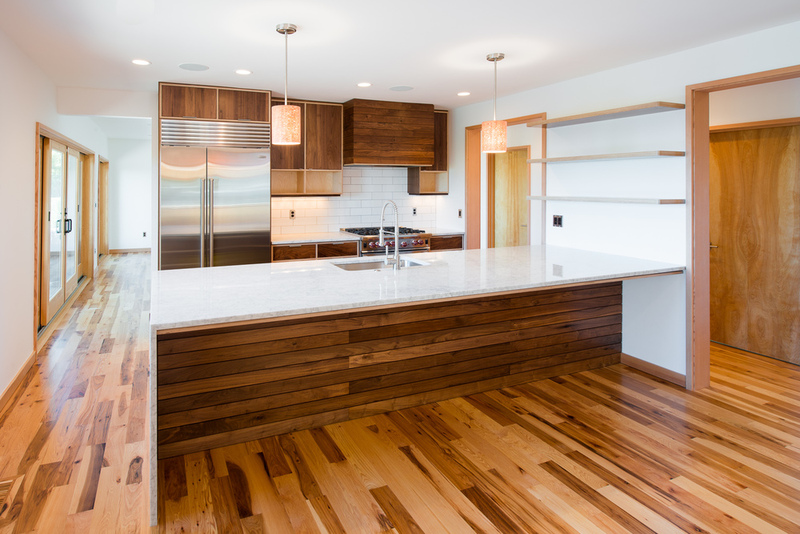 The cabinets were custom made by Crownwood Construction, with exposed birch plywood frames and walnut panels. The island and main kitchen counter have a carrara marble countertop, which is nicely complemented by matte-white subway tiles at the backsplash. We added a new bar where a redundant second fire place previously existed. 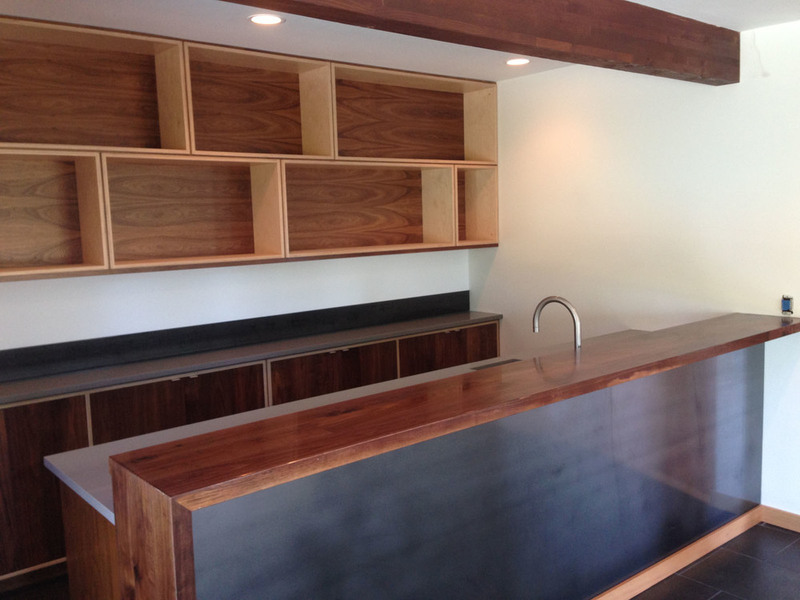 The bar employs the same language of walnut and plywood cabinets, with some tougher materials for durability. The countertops are a grey quartz from Cosmos, and the backsplashes and bar-front are made of the same sheet steel we used at the fireplace in the living room. We made a break from the hickory floors used throughout the rest of the first floor, and changed to tile, to make an appropriate transition to the pool immediately outside. The hall was previously an unpleasant space, which felt dark and narrow. Without changing the width of the hall, we able to create a much more inviting atmosphere. New openings along the wall dividing the hall from the public rooms increased the amount of natural lighting getting into the hall, which is supplemented by new can lighting. In the stair, we expanded on the approach we first employed at the Walsh residence by building a fir screen to filter the light coming into the space. 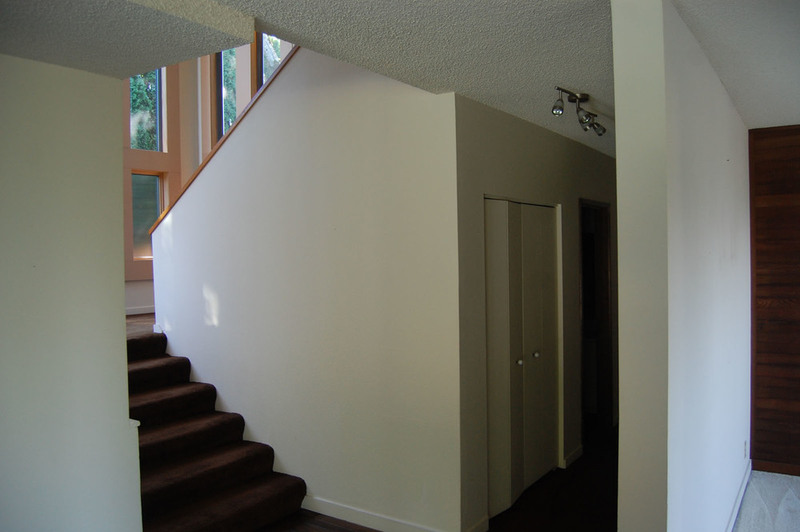 We demolished the partial height wall which was acting as a guardrail, and replaced it with a steel stair rail, which creates a stronger visual relationship between the two levels. 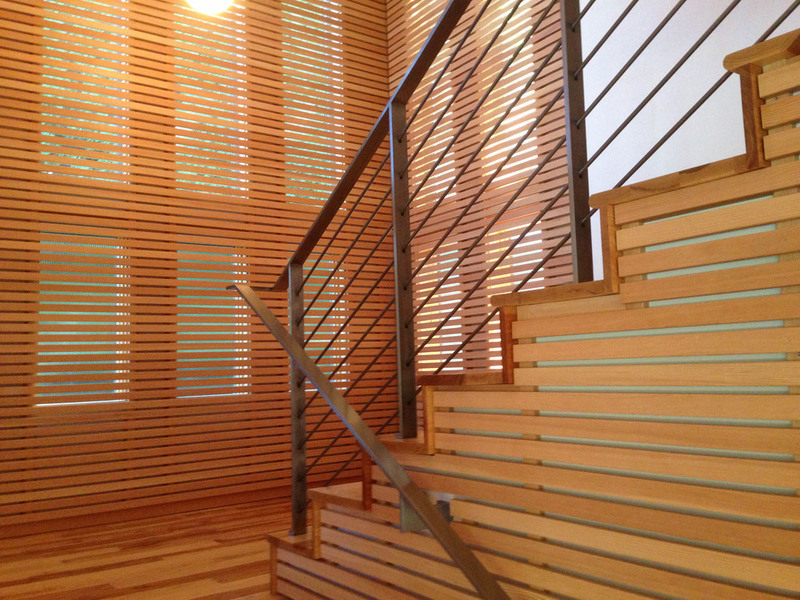 The previously utilitarian stairwell is now one of our favorite moments in the house. 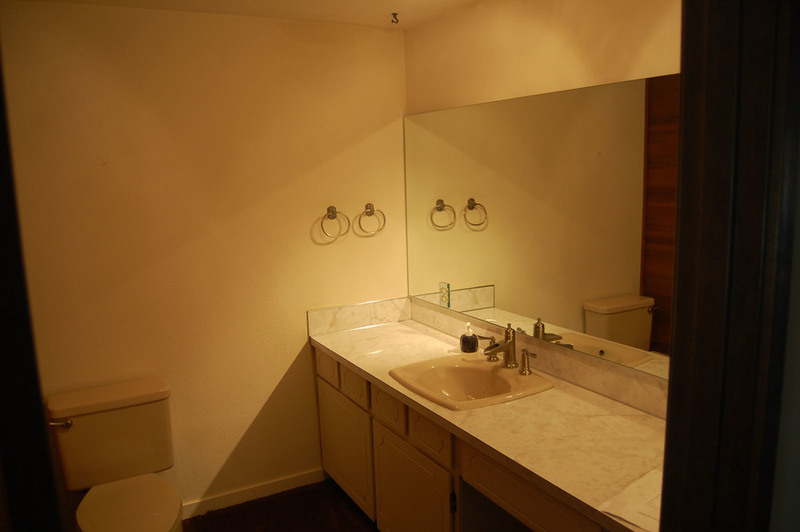 To avoid making major changes to plumbing and electrical system, we kept the existing layouts of the guest bathroom bathrooms, while making major changes to the finishes. We continued the use of the walnut and plywood cabinets, but drew a visual distinction from the kitchen and bar areas by having the vanities float 12" off the floor, with tile running underneath them all the way to the wall. The layout of the bedrooms on the second floor generally worked well, so we only made minor alterations, primarily to create more closet space for the master suite. 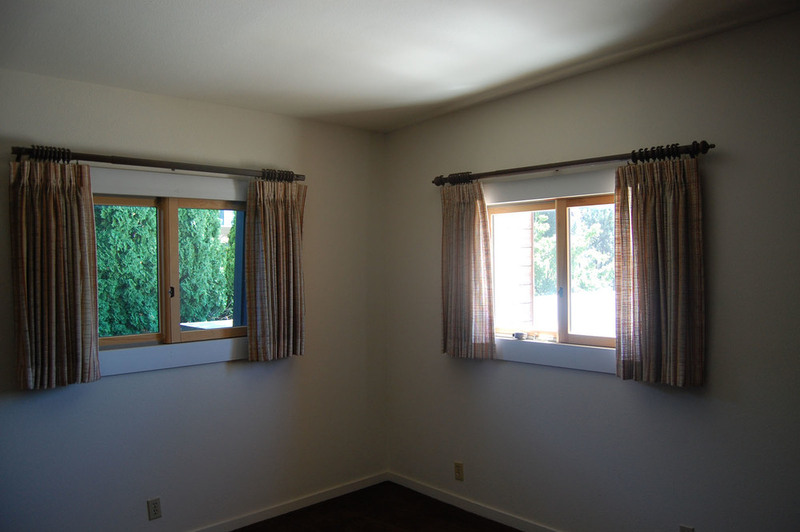 We installed new fir trim around the windows and ceiling beams, smoothed out and painted the walls, and installed new carpet throughout the second floor. As we near completion on the Skyline Residence, it's exciting to see the final items for the house being made. One of the last of these is a new steel guardrail for the existing stairwell. 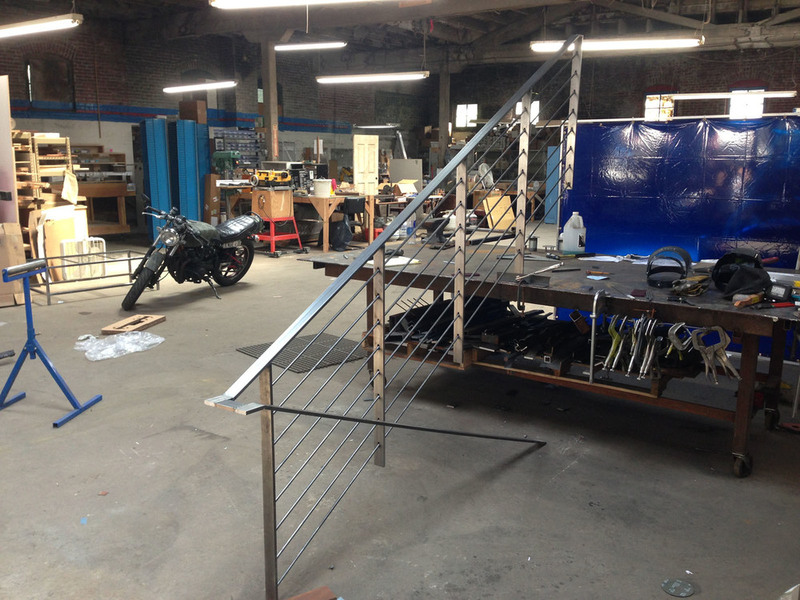 The guardrail is being fabricated for us by Greg Forcum Art & Furniture, whose shop we paid a visit to this morning. The rail is looking great, and we will be excited to see it installed on-site later this week. 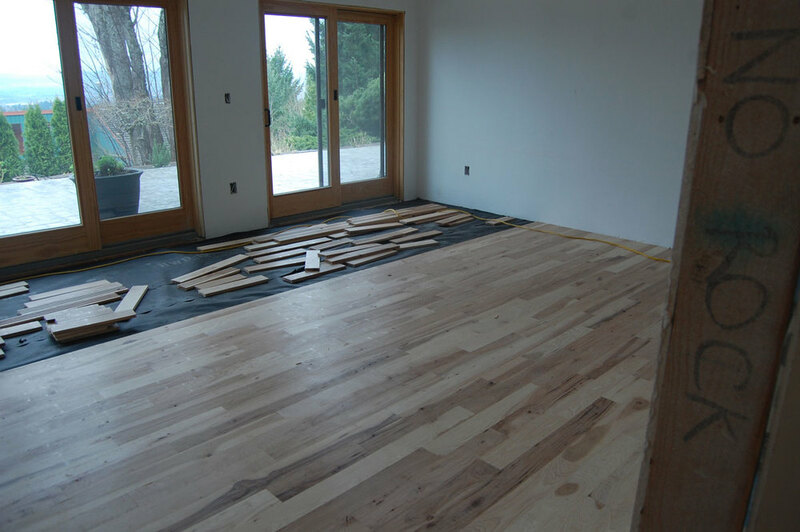 Since the last update on our progress at the Skyline Residence, we have finished the sheetrock work, and are now busy installing the hardwood floors throughout the main level of the house. 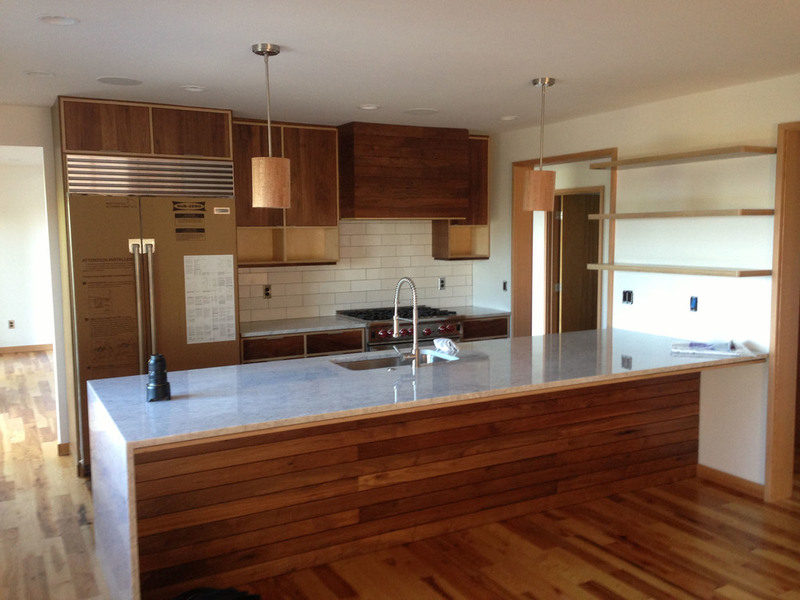 The homeowners chose a rustic hickory, with a naturally large degree of variation in its color and tone. Construction is ongoing at the Skyline Residence, which we last blogged about when we were beginning demolition. Since then, we have completed all the new framing, rough plumbing, electrical, and insulation. There is still a lot to do, but the difference in the quality of the spaces is already apparent. In the living room, we have removed the dropped ceiling, a legacy of a remodel in the 1980s. This gives us an extra 15" of ceiling height, as well as creating a cleaner, more defined space. We decided to keep the fireplace in the same location, so that we could reuse the existing structure and flue. The stone cladding has been removed, revealing the concrete block structure underneath, which we can now re-clad in a more contemporary manner. 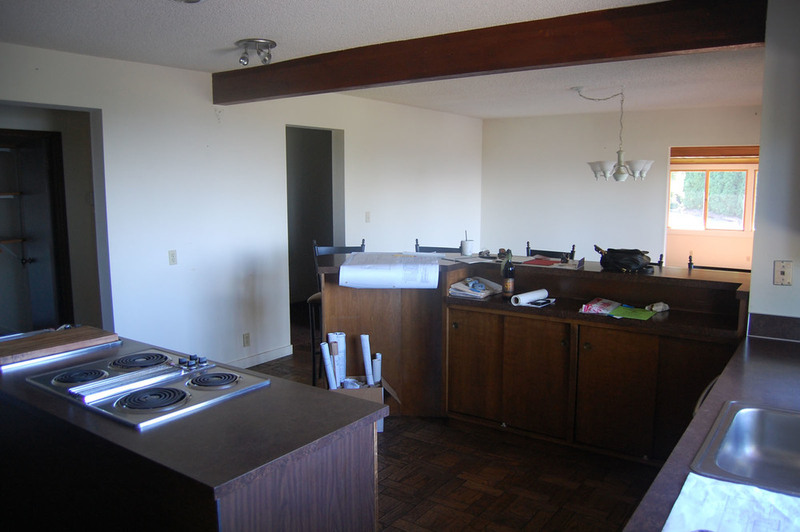 The existing kitchen dated from the 1970s, and looked like it. While the kitchen will occupy roughly the same location, we're starting from scratch with the layout, which required changing the location of some of the openings on the wall to the right hand side. The dropped beam has been pushed up into the ceiling, allowing for a continuous flush ceiling. New can lights have been installed in a neatly ordered grid. The next steps are to sheetrock all the walls, begin installation of tile and wood floors, install new cabinetry, and begin finish carpentry. We're excited by how this project is turning out, and look forward to sharing more photos of it. 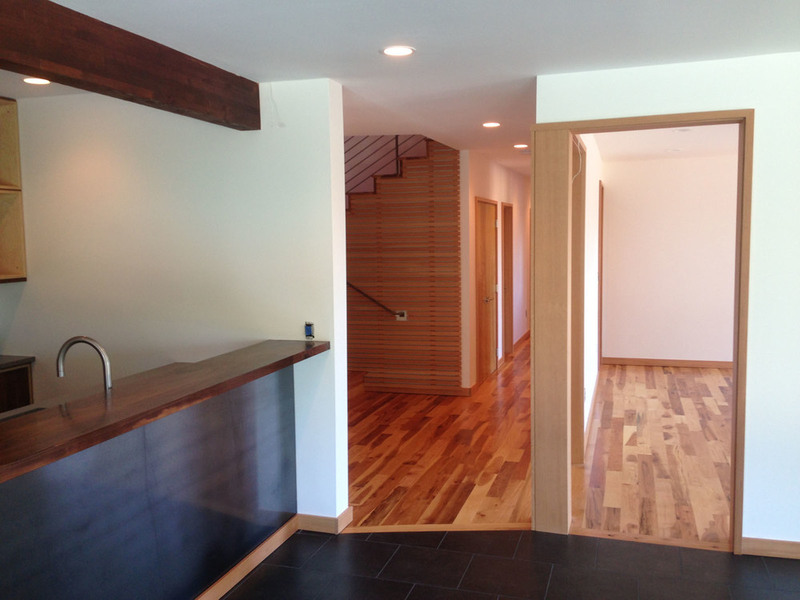 Our latest project is a remodel of a house near Skyline Blvd. 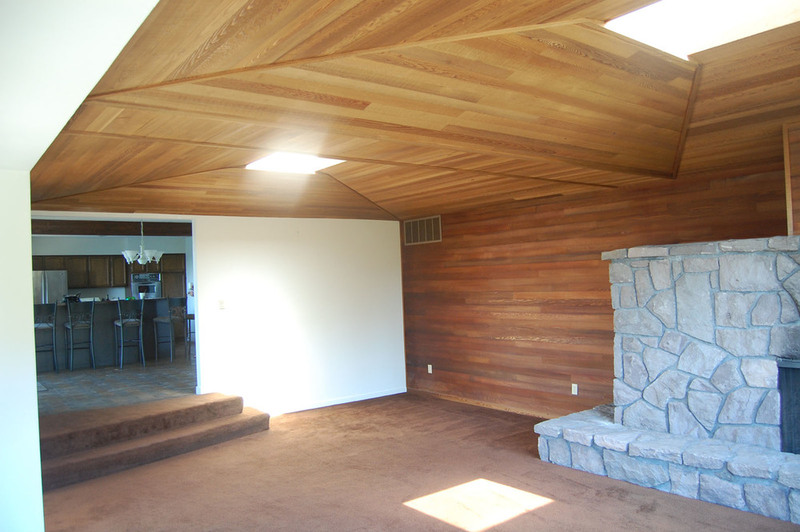 The house was built in 1970, and was given a very successful exterior remodel 5 years ago, but much of the original 1970s interior still remained. Our clients bought the house in the summer, with the intention of doing a complete remodel of the interior before they move in. Our design seeks to preserve the modern, open layout of the house, while making selective improvements to the flow through the building. By removing a wall between the hallway and an existing storage area, we were able to create a new mudroom off of the garage. Changing the kitchen layout creates a more efficient use of space, and creates a more logical relationship between the kitchen and the dining area. An entry area was added as part of the previous remodel, and made the old entry area near the back of the house redundant. By removing one of the walls adjacent to the old entry, we were able to create a new games room, which would also function equally well as a formal dining room. 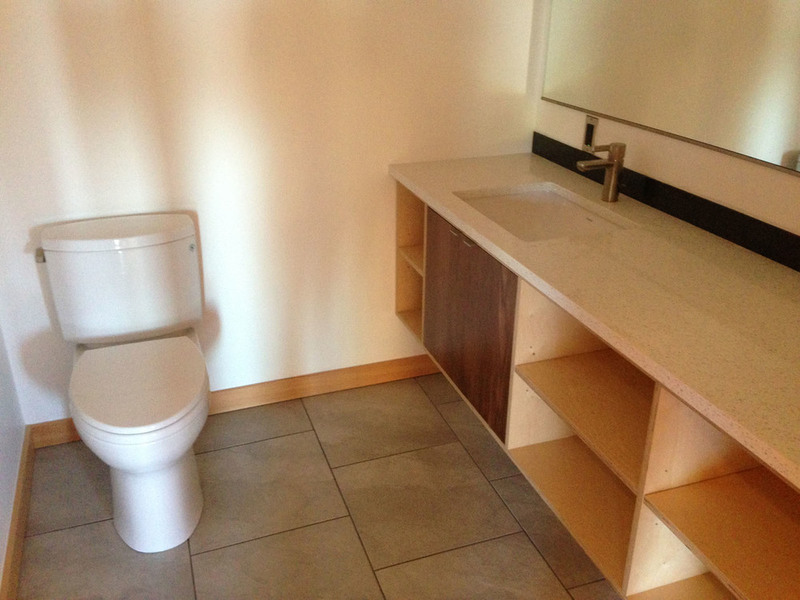 We received a building permit last week, and got started immediately with the task of removing the existing finishes.